Have you heard about this product yet? For the past month or so I have been using this AMAZING product! Sensibio H2O micelle solution is made by BIODERMA LABORATORIE DERMATOLOGIQUE that is based in Lyon, France. It is among the most frequently prescribed companies by french dermatologists. It is present in more then 70 countries and over the past 5 years the Laboratirie's average annual growth has been over 32%. Clearly they're doing pretty well, don't you think? Therefore there must be others who share my opinion of this non-rinse cleanser and make-up remover. This solution is formulated for sensitive, normal to dry skin. By using it for a while I have noticed that it also minimised the redness on my cheeks; for that I'm so happy about. Looking at the solution through the bottle you notice that it looks like water and in fact its consistency is very runny just like water. It is soap-free, fragrance-free, alcohol-free and Bioderma guarantees excellent ''ocular tolerance''. In other words it doesn't irratate the eyes. 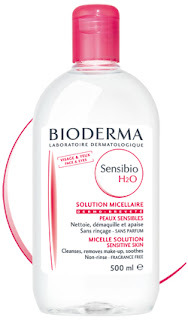 I use my Bioderma Sensibio H2O 500ml on the daily basis and find it very good at removing my waterproof make-up. For heavier eye make-up I soak a cotton wool, hold it on my eyes for about a minute and then just gently wipe off. It is so simple and highly effective, which is great for busy people like me. Let me know if you have tried it and what you think of it? I really like your blog and I hope you'll continue blogging and stay motivated! I really wish you the best of luck! I would love to follow you, but I don't see the "followers" button?